If you are related to me, and geographically close, you are almost certainly going to get a scarf for Christmas. Provided I keep up my one completed project a day pace. I'm already a day behind, but the day is barely middle aged. Being in the southern half of the planet, it is best to take into account the summer solstice, and make something that can be worn in hot weather. 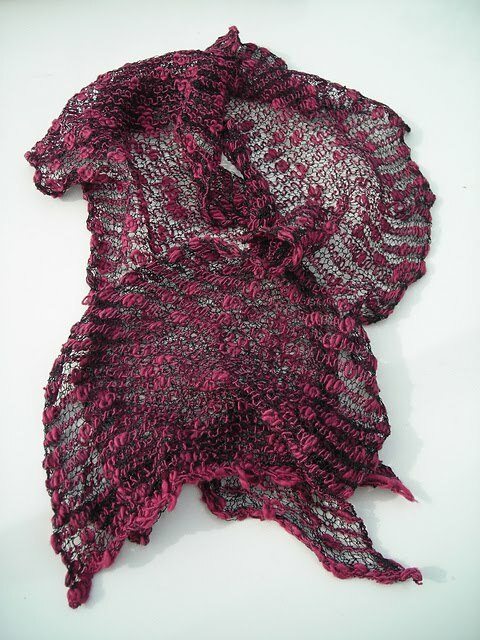 A perfect project is the floating squiggles scarf, invented by Angela McGregor, energetic and creative machine knitter, and current President of the MKAV. 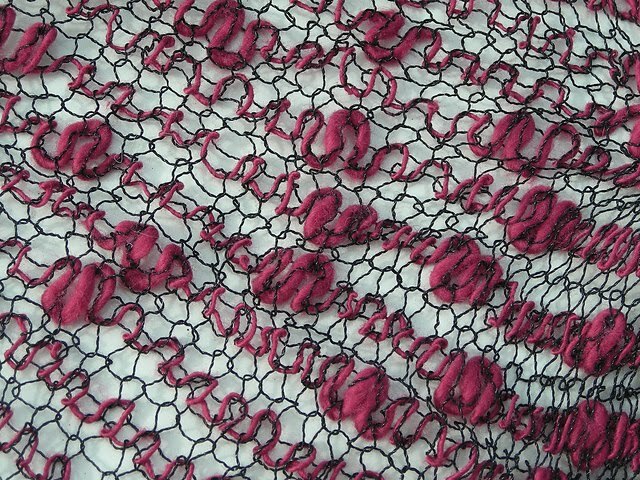 My black and pink version is made on a standard gauge knitting machine, using every second needle. It could just as well be hand knitted, but in that case I would use garter stitch and large needles. The yarns used are Avril Silk / Stainless steel, and Habu Nerimaki. These are available in Melbourne from Dairing http://www.dairing.com.au/ and from other retailers both local and international. The stainless steel yarn holds its interesting memory characteristics. The cotton yarn does not weigh it down used so sparingly, and it shows off the beauty of the thick and thin slub yarn. And it is super easy. Here is the pattern, for anyone in need of a quick but interesting gift project. Notes. Don't break the decorative thread, just take it out of the yarn feeder and hitch it over the end of the machine until you pick it up again a couple of rows later. If you are using a retail sized cone of the stainless yarn, Just knitting to the end of the cone gives a reasonable length for the scarf. The Nerimaki will go a long way used in this pattern. You might get two scarves out of it. Thanks Christine. I may give this a go over the holiday break! this is beautiful Christine! now I must head down to dairing for some gorgeous pink cotton slub!! It is really lovely and such a good way to display the squiggles!